I recently enjoyed 24 hours of suspended responsibility. And now I long to regain the lightness a brief retreat provided. 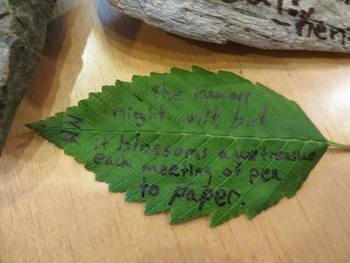 At the Sitka Center for Art and Ecology earlier this month, I spent the day playing with words. There was no pressure to write smart, clever or profound. We let loose, and encouraged each other to wonder, wander, explore. It was a luxury of sorts, and just what I needed. Like most people, my days are full of deadlines, demands and the small pressing acts living requires — meals to make, towels to wash, and worry over bills, health, housing and the myriad things beyond my control. In a life full of internal chatter, my day away allowed time for restorative quiet. Barbara Hurd writes that this sort of refuge helps "stop our natterings, our foot twitchings and restless tongues." Those who are fond of various retreats — writers, ecstatics, parents with young children — often comment on the silence such time away allows. Silence becomes something present, almost palpable. The central task shifts from keeping the world at a safe decibel distance to letting more of the world in. Thomas Aquinas said that beauty arrests motion. He meant, I think, that in the presence of something gorgeous or sublime we stop our natterings, our foot twitchings and restless tongues. Whatever our fretful hunger is, it seems momentarily filled in the presence of beauty. To Aquinas’s wisdom I’d add that silence arrests flight, that in its refuge our need to flee the chaos of noise diminishes. We let the world creep closer; we drop to our knees as if to let the heart, like a small animal, get its legs on the ground. On this Thankful Thursday, I am grateful for a day away, removed from worry and immersed in the pleasure of playing with words. It's Thankful Thursday, a weekly pause to appreciate people, places, things and more. Joy contracts and expands in proportion to our gratitude. What makes your world expand?